… propping up an auto maker that suddenly appears far less of a growth story than a year ago, while preserving the upward trajectory of TSLA stock price? The answer: the PowerWall pivot which is the latest attention-grabbing fad provided by Tesla in its constant attempt to define itself not so much as a company (it is a car company? is it a battery company? is it a taxpayer-funded hyperloop company?) but as a growth story. And while on the shiny surface, Musk once again did a great spin job of presenting the PowerWall as the next big thing in energy conservation and self-sustainability, the gloss promptly fades when one looks at the math behind the shiny facade. Which brings up an important point: is Elon Musk’s genius not in his inventor and developer abilities but merely his marketing skills. But that is the topic of a different post. The PowerWall batteries themselves likely run at about 48VDC, and are boosted by an internal DC-DC converter up to 350V-450V. This is to match the DC input of typical inverters. The huge difference in voltages means a significant efficiency hit – one-way efficiencies are probably about 94% to 97%. 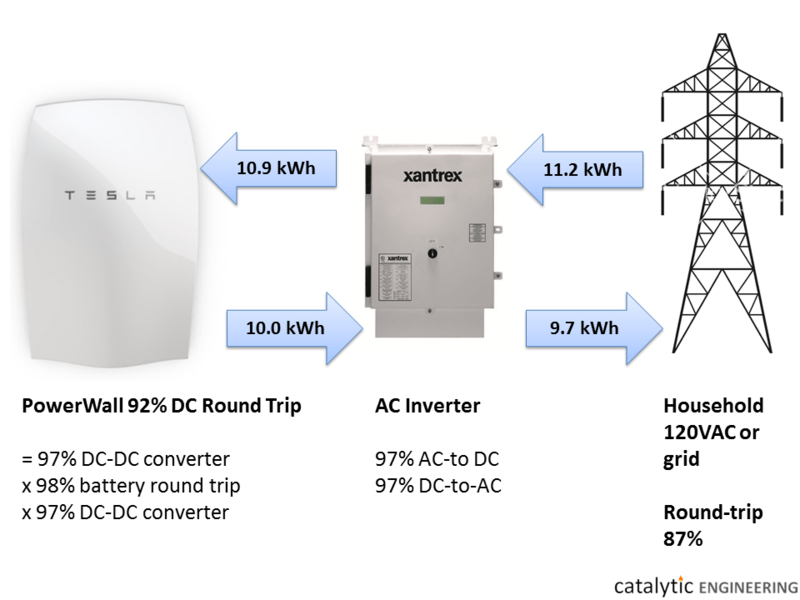 You have to add a AC-DC inverter (with 97% efficiency each direction), so your real-world AC-AC round trip efficiency drops to 87%. This is lower, but it doesn’t matter, because losing 13% of your low cost electricity is insignificant in the economics. Amortizing the capital cost of your system, by ensuring long lifetime for the batteries, is far more important. 2. The battery architecture is designed for long durations, which means low power. It’s likely that the battery packs are two modules identical to (or very similar to) the Tesla Model S design, in order to achieve production synergies. Each module has 6 groups, and 74 cells in parallel per group. This makes a total of almost 900 cells, with an operating voltage of about 48 VDC which makes certain safety aspects easier to design. The two packs are one-eighth of a Tesla Model S 85 kWh. 92% efficiency can only be achieved by running the battery at extremely low current, to minimize resistance losses. (Our Catalytic battery model suggests this is as low as 0.6A per cell) For example, a normal Tesla car battery probably has a DC-DC round-trip efficiency of less than 80% because people charge quickly (one round of resistance losses), and output high power when driving (a second round of resistance losses). The tradeoff is that they are putting in many, many cells to supply the 10 kWh – far more than would be necessary for the rated 2 kW of power, or even the peak 3.3 kW. (In a car, those two modules would be pushed to deliver about 30 kW of power) In other words, the PowerWall was designed for energy output, not power output. By the way, this is the traditional argument of flow battery proponents – if you want to store lots of energy in regular batteries, you wind up being massively oversized for your desired power output; the faster you discharge electrons, the bigger your losses become, and the bigger energy your battery has to become, to deliver the same kWh to the outside world. In essence, you’re paying for a lot of power you can’t use. Alternately, if you did want to run high power, you would need more cells to supply the 5 hours of energy. This isn’t a show-stopper – the achievement of $350/kWh (DC) is still significant. Customers will just need to be aware that they will need multiple units to serve high power. Another benefit of operating at such low current densities is that there will hardly be any waste heat during charge and discharge (as a result of the lower resistive losses). However, ambient temperatures will be the major thermal issue – cooling during hot days to ensure long lifetime, and heating to prevent the cells from freezing in the winter. We can guarantee the parasitic efficiency of the thermal regulation system is not included in the quoted 92% DC-DC efficiency – electric heating to keep the cells from freezing will be a big efficiency hit for outdoor-mounted units in cold climates. This shouldn’t be an issue for Australian early-adopters, but it will be interesting to see what users in Germany (Tesla’s other early target market) report. Along these lines, the flat design isn’t solely for aesthetics – it provides for more surface area for passive cooling, to keep the cells running cool and increasing their lifetime. Note that the raised “hump” in the design also discourages stacking of PowerWalls in front of each other. The fact the system runs on liquid cooling isn’t particularly significant. The Model S pack already uses liquid cooling, so why not use the same technology? How come 7 kWh is only $500 cheaper than 10 kWh? Most likely, they have the same two modules, and the 7 kWh unit is merely cycled more shallowly (70% of the depth-of-discharge of the 10 kWh unit). The 10 kWh unit is only rated for weekly cycling, which means far fewer cycles over its lifetime (about 500 rather than roughly 3,500). By comparison, the 100,000 mile warranty on the batteries in the 60 and 85 kWh Model S implies up to 1,700 deep-ish discharges, or a (much) higher number of (much) shallower discharge cycles. It’s fine if the 7 kWh “daily cycle” system loses capacity over repeated cycles, since it effectively has 30% more margin than the 10 kWh unit. Also, the fact that each cycle is very mild inherently reduces the chance of the undesired, damaging side-reactions that gradually impair batteries’ capacity. 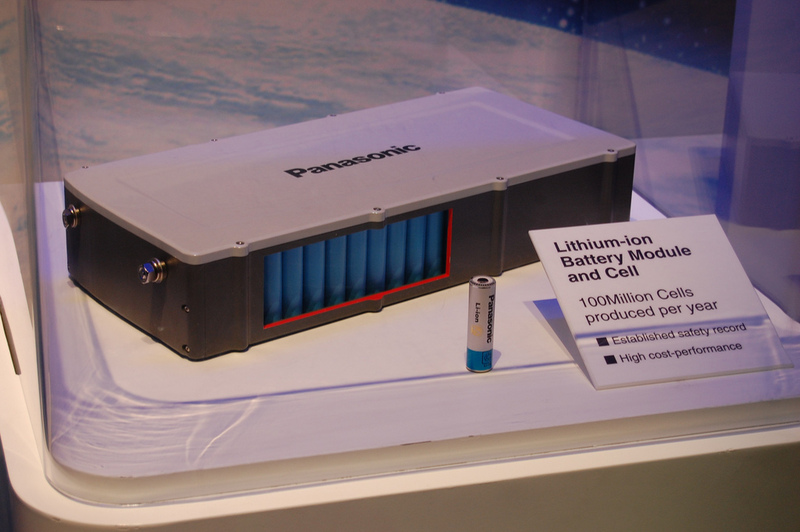 Interestingly, the 10 kWh high-energy system uses lithium nickel-cobalt-aluminum cells (the same chemistry used in the Model S), while the 7 kWh daily-cycle system uses lithium nickel-manganese-cobalt “NMC” cells (actually a more common chemistry, used in the Nissan Leaf and power tools). 2 kW should cover the average 1.2 kW electricity usage of the average American house, but 3.3 kW peak power will not be enough if you have many devices in a large American house, all running at once, and you want to disconnect entirely from the grid. Elon Musk noted in the 2015Q1 earnings call that it does not make economic sense to go off-grid, with PowerWalls. It was claimed that it might be economically in Germany, where feed-in-tariffs are less expensive – if there’s enough demand from our readers, we’ll do an economic analysis of this case next. The core cell cost that enables this $350/kWh cost is believable. Earlier this year Swedish researchers polled a number of battery electric vehicle manufacturers on their proprietary cost structures, andestimated that Nissan and Tesla are currently at $200-$300 per kWh for the battery pack. The PowerWall sale price is an excellent real-world confirmation that manufacturing prices really are in this range. However, the $3,000 or $3,500 cost is for the DC system only – be careful to compare apples to apples when looking at other products. For example, the inverter will add around $1,000 to $2,000 to the cost of the device. As another real-world point, SolarCity is quoting $7,140 to add the PowerWall to a solar installation (includes inverter, maintenance contract, installation, control system). This doesn’t sound unreasonable, and again $700/kWh for a small home-scale system is very cheap, though as mentioned above, multiple PowerWalls may be needed for many customers. SolarCity is doing well with this sort of deal – the price is for new solar installations only, where SolarCity would have to install an inverter, control system, and wiring anyway, so it’s cheap for them to kill two birds with one stone. 7. The PowerWall does not let you make money on arbitrage, and Tesla knows it. Tesla executives confirmed that the economics don’t work in America, and here’s why. As a residential owner, in the best case you’ll make 40 cents/kWh selling to the grid at peak hours, and buy at 10 cents/kWh at night. (Northern California utility PG&E’s Time Of Use residential rate sheet). Once you include round-trip efficiency losses, that’s about $1.66 gross profit per 7 kWh (DC) cycle. Note that PG&E gives you that 40 cents/kWh only during the summer (defined as May-October). For the other half of the year, the difference is negligible and uneconomic. So revenue is $1.66 x 183 days x 10 years = $3,000. You’ll just about recoup the cost of the product, but you won’t profit because of two factors – the cost of inverter and installation, and the time value of money. We’re in a low-interest environment, but setting aside $7,000 today to make back $3,000 over 10 years still leaves you down $4,000 – not a very good deal. Your utility will be happy that you help them smooth out peaks and troughs this way, but they won’t make it worth your while. In the longer run, enlightened utilities may offer you demand pricing if you promise to keep maximum power low, or pay you to absorb spikes in power. And it’s likely that SolarCity (or the other installers) will take a cut for interfacing with the utility on your behalf, to participate in these kinds of demand-side management activities. It’s still hard to see this win on raw economics for a typical homeowner. – Customers who highly value staying powered during blackouts, and specifically want a battery. A generator would be cheaper, but the battery will be quieter, quicker to start, and avoid fuel storage. – Early adopters who enjoy being able to show off the sleekly-designed PowerWall to their friends. It worked for the Tesla Roadster. We’ll do a more detailed analysis of levelized cost of electricity (LCOE) and the German use case in a later article. What this means is that, by itself, the Tesla PowerWall residential unit won’t disrupt the energy industry, as it’s looking like a niche product. The 40,000 early adopters that have reserved a PowerWall add up to 0.4 GW (a fraction of a single fossil power plant, or a very large solar installation, or 4,500 Model S cars). It’s yet not clear that it will expand much beyond that. Still, it’s cheap, and it’s available (soon). These are huge factors in the energy business, and could lead to further scale. The $350/kWh (DC) number is impressive, and Tesla did a good job of shocking industry watchers by quoting the DC-only, no-installation cost. Even the full price of $700/kWh (AC) is very cheap for a small-scale residential product, and research labs and energy storage competitors are going to have to explain their own path to beating that number. We don’t have much information about the large-scale utility systems yet. We would expect them to be cheaper than $700/kWh all-in, and this already may be enough to gain significant traction. The highly modular approach with small building blocks (100 kW) is interesting – this could be a Google server type approach where a system is built of many cheap, replaceable parts. If there’s enough interest we’ll write more on this later. Commercial customers can benefit from avoiding demand charges – if they commit to never exceeding a certain maximum power, this can gain them significant savings from their utility suppliers. This will be particularly true for commercial customers with large solar arrays in jurisdictions where feed-in tariffs are lower than utility rates – if they produce surplus electricity, it could be far more lucrative for them to charge their batteries, to minimize their grid draw when utility rates are highest. On the Tesla side, there may be a supply chain play here. Every time Tesla doesn’t meet purchase agreements or sells fewer cars than projected, it can use these PowerWalls to soak up supply. Used battery packs may be a future part of the equation as well. Used packs are difficult to maintain and recycle, since they represent a safety risk, so rebuilding them into 7 kWh PowerWalls (running at extremely low current to extend their life) may allow Tesla to hit ever lower price points going forward. There are a lot of details that Tesla would like to paper over in their $350/kWh (DC) announcement – so we hope that you find this analysis useful and perhaps a bit more in-depth than the first wave of articles published elsewhere. Still, Tesla’s PowerWall release is a ground-breaking announcement and a challenge to the rest of the industry, and we look forward to what comes next. P.S. For our attentive readers who were keeping track, here’s number 10: The presentation started almost an hour late, and the electrical power for the event was run entirely on the batteries. Not to say that they’re linked, but a good reminder that it’s still early days for this technology and product, especially as Tesla has job postings for dozens of engineers to work on the second (non-prototype) generation of the PowerWall.